Two additional antibodies for their utilization in western blotting are successfuly validated. Specifically, one antibody specific for the detection of PI3K p85 /p55 (pTyr467) has been validated in the human cell line HeLa, while no band was visible in the insect cell line C6/36. 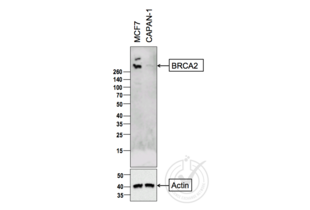 Additionally Breast Cancer 2, Early Onset (BRCA2) could be detected in the human cell line MCF7. Human CAPAN-1 cells were used in this assay as negative control. Since we started the initiative we have successfully validated 69 products. The first was a anti-Fibrinogen antibody, followed by a couple of other interesting antibodies and ELISA kits. The latest succesfully validated products are the two antibodies for the detection of PI3K p85 /p55 (pTyr467) and Breast Cancer 2, Early Onset (BRCA2). A few more products are currentlly being validated.